:Join Dr. Gregory Jantz on a 12-week journey to lasting hope-and relief-from the battle and despair of depression. When medication and therapy just don't solve the depression plaguing you or your loved one, you can now find hope toward healing with a proven approach from a leader in depression therapy. Based on Dr. Jantz's groundbreaking book, Healing Depression for Life, this interactive workbook will equip readers with the tools they need to find a holistic approach to treatment. Week by week, you'll examine the chemical, emotional, physical, and spiritual causes of depression, and work to create a personalized plan based on your individual medical history. Discover a new way forward-and finally find relief when hope is nearly lost. 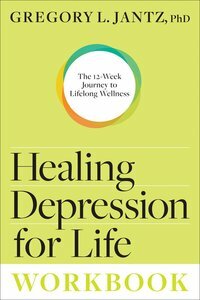 About "Healing Depression For Life (Workbook)"